"Very good service - as impressive as my last Silver Valet." "What can I say when you get people asking if your car has been resprayed, you know the job is great. Well worth the travel. The guys did a cracking job. " 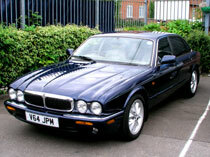 "Brought in a 1999 XJ8 with a steering wheel which looked as if a grease monkey had been driving it for a living. 3 hours later it looked as new. "After taking delivery of my car after it being brought back from the dead, the after-sales and customer support I received was second to none. I had a few problems that appeared after a few weeks and was asked to return the car [to Clean Image] immediately where everything was sorted out to my satisfaction. No questions, just answers. Just 33 minutes from Upminster! ...unique services, well worth the journey. Gary explained everything that needed be done as well as giving us tips to prevent further damage in the future. The car was ready with all the paint successfully removed and then valeted to a vary high standard. I am very pleased with the result on collecting the car, the staff were very nice and helpful and gave a break down of everything that had been done to the car. I would definitely recommend Clean Image and will use them again. Thanks for a fabulous job. " Note - Removing the paint from the boot of this Renault Clio was the first job done by our newest employee - Terrance. "I would like to say how pleased I was with all aspects of your service. Telephone manner, advice and service were excellent. Should I have the opportunity I would certainly use you again and recommend you to others. The car previously had a tobacco odour which was not the problem - the chemicals you used left a residue of odour which faded away with time. "Helpful on phone when booking and returned called as agreed. Made to feel welcome on arrival. Work done in time agreed. Quality of work very good. Food at pub very good. Suggest only improvement would be a tidy of the premises as it would give a better impression on arrival. " Reply - I know, I know! It's a bit of a mess at Clean Image at the moment. We must try harder to live up to our company name! The good news is that we have a new ceiling scheduled for fitting (it's currently making a mess as it's stacked in the workshop!) and we are looking to have new offices built - this remodeling will include extra storage space for all our gear. we only then need a lick of paint and we will look like a new company. A company that is called "Clean Image" really should make the effort! "Mark went to great lengths to explain what could be done beforehand and afterwards explained what had been done and why. Very pleased with the service provided. Perhaps a waiting area for customers could be a future consideration? " Reply - You will be pleased to hear that a customer waiting room is a current consideration. As mentioned above, we have a new ceiling scheduled to be done - then will come new offices, counter and waiting room. We have already 'had a man in' to look at it. We are only sorry that you had to wait at all. We offer our apologies. 7. Good value all round - Although my spend was not massive, I was treated as if I had spent a thousand. "